The average human brain weighs around three pounds with a volume of about 1130 cubic centimeters. Our brain is the most developed, in size and function, among mammals. Though it is three times as large as a typical mammal, we are able to use only a fraction of our brain. Wearing the fancy Cyber Leader helmet will not result in being able to use more of our brains (we would have to be Einsteins to do that), but it will definitely increase our capacity to have more fun. Now you may wonder what’s the connection between the brain and the Cyber Leader helmet. The Cyber Leader (or Cybermen) is a fictional character appearing on the longest running science fiction show, Doctor Who. They are a race of cyborgs known for their cold, calculating behavior. As they prefer logic over emotions, their brains are enclosed in a transparent forehead and are proudly put on display. These humanoids are the inspiration behind the Doctor Who Cyber -Leader Voice Changer Helmet. The first thing that will catch your eye when you look at the helmet is the pink, squishy brain neatly packed in a transparent forehead. The other design features of the helmet are also impressive and eye catching. Below the transparent forehead is a mean looking black visor that spells only one thing – danger. An intriguing feature of this helmet is a black cavity directly above the transparent forehead. One of the reasons to have such a cavity is to allow the brain to breathe. It may sound absurd, but it is probably true. Two tubular pipes attach the top of the head to the ears; when you are not wearing the helmet, you could use the pipes as a grip to carry the helmet around. Apart from its radical looking head, the true genius of the helmet (discounting the brain, of course) is its voice changing features. This Cyber Leader has not one, but three different play buttons to activate different kinds of voices. The first button simply replays cyberman phrases with lights going on and off in the mouth of the helmet. The third button reproduces cool sounding cyber weapon effects. What happened to the second button you may wonder; well…the best is always saved for the last. The second button changes your voice to sound exactly like a cyberman. Imagine all the role-playing you can do with this. 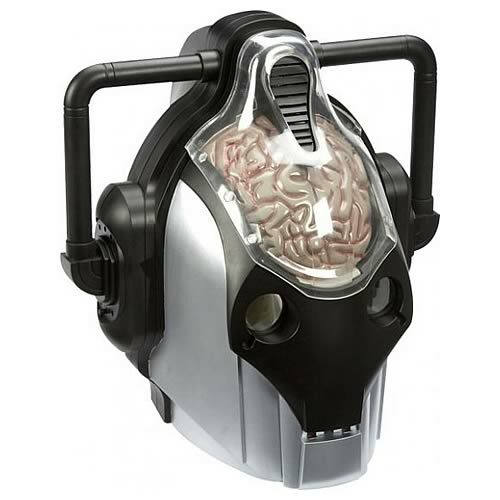 So, if you wish to proudly display your artificial brain or simply role-play, and if you are more than five years old, definitely try on the Cyber Leader Voice Changer Helmet which is available at $59.99. If you wish to know more about such cool stuff, go through Judoon Helmet and Glass LED Diving Helmet.